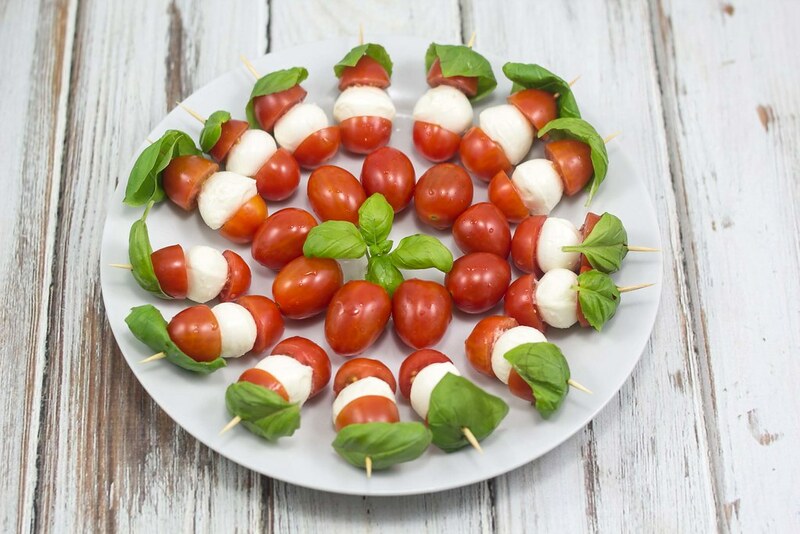 This is a simple but very delicious recipe for small tomato, mozzarella and basil skewers. We have made them as a part of a tapas dinner and they turned out really good. Besides they are great for a tapas, they can also be used as snacks for lunch or maybe a party. They are super easy to prepare and it only takes about 10 minutes to make 10-20 skewers. If you have some good olive oil; give them a couple of drops and these snacks are super delicious. If you are interesting in other great recipes for a tapas dinner we have a category for that. 1. Rinse the cherry tomatoes and cut them in half. 2. Place a small mozzarella ball in-between the two tomato halves. 3. Put a small wooden skewer/toothpick or similar through the tomato and mozzarella. 4. Finally put a leaf of fresh basil on the skewer. Caprese salad on a stick! We make something very similar for our catering business. Try making a little balsamic vinaigrette to drizzle over your skewers for an extra flavor punch!